You know how frustrating it can be to see your expected profits go down the drain. 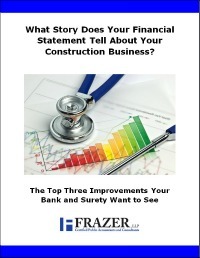 Unfortunately, profit fade can be the downfall of many contractors. Here are a few tactics that can help ensure your profits don’t fade away in a mist. The profit you calculate when bidding a job can fluctuate dramatically as work progresses. For every phase finished under budget, there may be an unexpected problem waiting to wipe out the savings. If you want to end at the top of the arc, stay on top of each project’s swings. Every significant cost increase should be accompanied by a change order that increases the contract’s value. If it isn’t, determine why. Was your initial estimate off? Or have you done extra work that wasn’t covered by a change order? In either case, you’re headed for profit fade, and you must find ways to get the job back to “profit friendly” status. In addition to monitoring work in progress, study your estimating and profit histories. Review jobs that didn’t work out so well to determine where they didn’t meet budgets and whether expenses were allocated properly. Ask your supervisors whether the assumptions you used in estimating the projects were valid. Did you, for example, realistically calculate the number of bricks your crews could lay in a day? Were your average labor costs accurate? Also consider direct and indirect costs, and compare estimates on jobs that lost money to those on profitable projects. Use those results to improve estimating procedures on future projects. If, for example, projects were delayed because you expected your project manager to obtain final foundation design approvals and shop drawings while also getting the job under way, revisit your staffing estimates. Look, too, at whether certain owners cost you money. If an owner consistently moved walls or added doors, be sure that any future contracts with the owner include specific language regarding scope and specification changes, change orders and schedule revisions. Before work begins, understand fully what you’re contracted to do. Contract language is often unclear, resulting in differences in interpretations that can disrupt and delay projects. Conducting a careful review of the contract and clarifying any uncertainties at the start of the job can help prevent disruptions and delays going forward. Also make sure your project managers understand the contract language fully. Meet with them before every project to discuss not only the contractual provisions for scope of work and change orders, but also what you bid and why. As work progresses, meet with your project managers regularly to make sure they’re comparing their actual costs to the bid cost amounts. If a problem arises, they can address it with the owner immediately. They should also note the reason for the issue. For example, if you’re typically plagued by weather delays during a certain time of year, you may need to build a little more time into your bids. If there’s a problem, remember that your leverage is strongest before the project is finished. Owners need your help to meet their goals, and they may be more amenable to approving change orders while you’re still on the job. If you wait until projects are done, owners will have use of the facilities and may not release your retainage. In other words, they’re holding all the cards. Profit fade can be perilous to your contracting business and shouldn’t be ignored. But there’s an upside to proactively combating profit fade: Your surety will be more confident in your ability to make a profit. We welcome the opportunity to help you prevent profit fade, take a proactive approach to cash-flow management, or other issues your construction company may face. Click the button below for a complimentary consultation.